Copernicium is a chemical element with symbol Cn and atomic number 112. It is an extremely radioactive synthetic element that can only be created in a laboratory. The most stable known isotope, copernicium-285, has a half-life of approximately 29 seconds. Copernicium was first created in 1996 by the GSI Helmholtz Centre for Heavy Ion Research near Darmstadt, Germany. 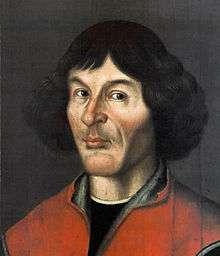 It is named after the astronomer Nicolaus Copernicus. In the periodic table of the elements, it is a d-block transactinide element. During reactions with gold, it has been shown to be an extremely volatile metal and a group 12 element, so much so that it is probably a gas at standard temperature and pressure. Copernicium is calculated to have several properties that differ between it and its lighter homologues, zinc, cadmium and mercury; due to relativistic effects, it may even give up its 6d electrons instead of its 7s ones. Copernicium has also been calculated to possibly show the oxidation state +4, while mercury shows it in only one compound of disputed existence and zinc and cadmium do not show it at all, although more recent calculations cast doubt on this possibility. It has also been predicted to be more difficult to oxidize copernicium from its neutral state than the other group 12 elements. Copernicium was first created on February 9, 1996, at the Gesellschaft für Schwerionenforschung (GSI) in Darmstadt, Germany, by Sigurd Hofmann, Victor Ninov et al. This element was created by firing accelerated zinc-70 nuclei at a target made of lead-208 nuclei in a heavy ion accelerator. A single atom (the second was subsequently dismissed) of copernicium was produced with a mass number of 277. In May 2000, the GSI successfully repeated the experiment to synthesize a further atom of copernicium-277. This reaction was repeated at RIKEN using the Search for a Super-Heavy Element Using a Gas-Filled Recoil Separator set-up in 2004 and 2013 to synthesize three further atoms and confirm the decay data reported by the GSI team. The IUPAC/IUPAP Joint Working Party (JWP) assessed the claim of discovery by the GSI team in 2001 and 2003. In both cases, they found that there was insufficient evidence to support their claim. This was primarily related to the contradicting decay data for the known nuclide rutherfordium-261. However, between 2001 and 2005, the GSI team studied the reaction 248Cm(26Mg,5n)269Hs, and were able to confirm the decay data for hassium-269 and rutherfordium-261. It was found that the existing data on rutherfordium-261 was for an isomer, now designated rutherfordium-261m. Using Mendeleev's nomenclature for unnamed and undiscovered elements, copernicium should be known as eka-mercury. In 1979, IUPAC published recommendations according to which the element was to be called ununbium (with the corresponding symbol of Uub), a systematic element name as a placeholder, until the element was discovered (and the discovery then confirmed) and a permanent name was decided on. Although widely used in the chemical community on all levels, from chemistry classrooms to advanced textbooks, the recommendations were mostly ignored among scientists in the field, who either called it "element 112", with the symbol of (112) or even simply 112. Copernicium has no stable or naturally-occurring isotopes. Several radioactive isotopes have been synthesized in the laboratory, either by fusing two atoms or by observing the decay of heavier elements. Six different isotopes have been reported with atomic masses from 281 to 285, and 277. Most of these decay predominantly through alpha decay, but some undergo spontaneous fission. All copernicium isotopes are extremely unstable and radioactive; in general, heavier isotopes are more stable than the lighter. The most stable isotope, 285Cn, has a half-life of 29 seconds. Other isotopes have half-lives shorter than 0.1 seconds. 281Cn and 284Cn both have half-lives of 97 ms, and the other two isotopes have half-lives slightly under one millisecond. It is predicted that the heavy isotopes 291Cn and 293Cn may have half-lives of around 1200 years, and may have been produced in the r-process and be detectable in cosmic rays, though they would be about 10−12 times as abundant as lead. The lightest isotopes were synthesized by direct fusion between two lighter nuclei and as decay products (except for 277Cn, which is not known to be a decay product), while the heavier isotopes are only known to be produced by decay of heavier nuclei. The heaviest isotope produced by direct fusion is 283Cn; the two heavier isotopes, 284Cn and 285Cn have only been observed as decay products of elements with larger atomic numbers. In 1999, American scientists at the University of California, Berkeley, announced that they had succeeded in synthesizing three atoms of 293Uuo. These parent nuclei were reported to have successively emitted three alpha particles to form copernicium-281 nuclei, which were claimed to have undergone an alpha decay, emitting an alpha particle with decay energy of 10.68 MeV and half-life 0.90 ms, but their claim was retracted in 2001. The isotope, however, was produced in 2010 by the same team. The new data contradicted the previous (fabricated) data. Copernicium is the last member of the 6d series and is the heaviest group 12 element in the periodic table, below zinc, cadmium and mercury. It is predicted to differ significantly from the lighter group 12 elements. The valence s-subshells of the group 12 elements and period 7 elements are expected to be relativistically contracted most strongly at copernicium. This and the closed-shell configuration of copernicium result in it probably being a very noble metal. Its metallic bonds should also be very weak, possibly making it extremely volatile, like the noble gases, and potentially making it gaseous at room temperature. However, it should be able to form metal–metal bonds with copper, palladium, platinum, silver, and gold; these bonds are predicted to be only about 15–20 kJ/mol weaker than the analogous bonds with mercury. 4 should also be able to exist in aqueous solution. Copernicium should be a very heavy metal with a density of around 23.7 g/cm3 in the solid state; in comparison, the most dense known element that has had its density measured, osmium, has a density of only 22.61 g/cm3. This results from copernicium's high atomic weight, the lanthanide and actinide contractions, and relativistic effects, although production of enough copernicium to measure this quantity would be impractical, and the sample would quickly decay. However, some calculations predict copernicium to be a gas at room temperature, the first gaseous metal in the periodic table (the second being flerovium), due to the closed-shell electron configurations of copernicium and flerovium. The atomic radius of copernicium is expected to be around 147 pm. Due to the relativistic stabilization of the 7s orbital and destabilization of the 6d orbital, the Cn+ and Cn2+ ions are predicted to give up 6d electrons instead of 7s electrons, which is the opposite of the behavior of its lighter homologues. In addition to the relativistic contraction and binding of the 7s subshell, the 6d5/2 orbital is expected to be destabilized due to spin-orbit coupling, making it behave similarly to the 7s orbital in terms of size, shape, and energy. Hence copernicium may not be a noble transition metal, but rather a semiconductor with a band gap of around 0.2 eV. 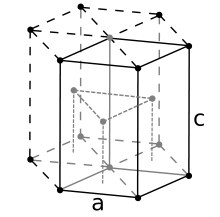 Copernicium is expected to crystallize in the hexagonal close-packed crystal structure, with lattice parameters a = 332 pm and c = 540 pm. The c/a ratio of 1.63 is the ideal value, establishing a kinship between solid copernicium and the solid noble gases, though its cohesive energy (enthalpy of crystallization) should be on the order of that of mercury rather than be near the lower value of the noble gases. Interest in copernicium's chemistry was sparked by predictions that it would have the largest relativistic effects in the whole of period 7 and group 12. Copernicium has the ground state electron configuration [Rn]5f146d107s2 and thus should belong to group 12 of the periodic table, according to the Aufbau principle. As such, it should behave as the heavier homologue of mercury and form strong binary compounds with noble metals like gold. Experiments probing the reactivity of copernicium have focused on the adsorption of atoms of element 112 onto a gold surface held at varying temperatures, in order to calculate an adsorption enthalpy. Owing to relativistic stabilization of the 7s electrons, copernicium shows radon-like properties. Experiments were performed with the simultaneous formation of mercury and radon radioisotopes, allowing a comparison of adsorption characteristics. The first experiments were conducted using the 238U(48Ca,3n)283Cn reaction. Detection was by spontaneous fission of the claimed parent isotope with half-life of 5 minutes. Analysis of the data indicated that copernicium was more volatile than mercury and had noble gas properties. However, the confusion regarding the synthesis of copernicium-283 has cast some doubt on these experimental results. Given this uncertainty, between April–May 2006 at the JINR, a FLNR–PSI team conducted experiments probing the synthesis of this isotope as a daughter in the nuclear reaction 242Pu(48Ca,3n)287Fl. In this experiment, two atoms of copernicium-283 were unambiguously identified and the adsorption properties indicated that copernicium is a more volatile homologue of mercury, due to formation of a weak metal-metal bond with gold, placing it firmly in group 12. Because the lighter group 12 elements often occur as chalcogenide ores, experiments were conducted in 2015 to attempt to deposit copernicium atoms on a selenium surface to form copernicium selenide, CnSe. Reaction of copernicium atoms with trigonal selenium to form a selenide were observed, with ΔHadsCn(t-Se) > 48 kJ/mol, with the kinetic hindrance towards selenide formation being lower for copernicium than for mercury. This was unexpected as the stability of the group 12 selenides tends to decrease down the group from ZnSe to HgSe, while it increases down the group for the group 14 selenides from GeSe to PbSe. 1 2 3 4 5 6 7 8 9 10 11 12 13 14 15 Hoffman, Darleane C.; Lee, Diana M.; Pershina, Valeria (2006). "Transactinides and the future elements". In Morss; Edelstein, Norman M.; Fuger, Jean. The Chemistry of the Actinide and Transactinide Elements (3rd ed.). Dordrecht, The Netherlands: Springer Science+Business Media. ISBN 1-4020-3555-1. 1 2 3 Eichler, R.; Aksenov, N. V.; Belozerov, A. V.; Bozhikov, G. A.; Chepigin, V. I.; Dmitriev, S. N.; Dressler, R.; Gäggeler, H. W.; et al. (2008). "Thermochemical and physical properties of element 112". Angewandte Chemie. 47 (17): 3262–6. doi:10.1002/anie.200705019. Retrieved 5 November 2013. 1 2 Fricke, Burkhard (1975). "Superheavy elements: a prediction of their chemical and physical properties". Recent Impact of Physics on Inorganic Chemistry. 21: 89–144. doi:10.1007/BFb0116498. Retrieved 4 October 2013. 1 2 3 Gaston, Nicola; Opahle, Ingo; Gäggeler, Heinz W.; Schwerdtfeger, Peter (2007). "Is eka-mercury (element 112) a group 12 metal?". Angewandte Chemie. 46 (10): 1663–6. doi:10.1002/anie.200604262. Retrieved 5 November 2013. ↑ Eichler, R.; et al. (2007). "Chemical Characterization of Element 112". Nature. 447 (7140): 72–75. Bibcode:2007Natur.447...72E. doi:10.1038/nature05761. PMID 17476264. 1 2 Hofmann, S.; et al. (1996). "The new element 112". Zeitschrift für Physik A. 354 (1): 229–230. doi:10.1007/BF02769517. 1 2 Barber, R. C.; et al. (2009). "Discovery of the element with atomic number 112" (PDF). Pure and Applied Chemistry. 81 (7): 1331. doi:10.1351/PAC-REP-08-03-05. ↑ "Element 112 shall be named "copernicium"". Gesellschaft für Schwerionenforschung. 14 July 2009. 1 2 "New element named 'copernicium'". BBC News. 16 July 2009. Retrieved 2010-02-22. 1 2 3 4 5 Holden, N. E. (2004). "Table of the Isotopes". In D. R. Lide. CRC Handbook of Chemistry and Physics (85th ed.). CRC Press. Section 11. ISBN 978-0-8493-0485-9. ↑ Zagrebaev, Valeriy; Karpov, Alexander; Greiner, Walter (2013). "Future of superheavy element research: Which nuclei could be synthesized within the next few years?" (PDF). Journal of Physics: Conference Series. 420. IOP Science. pp. 1–15. Retrieved 20 August 2013. 1 2 3 Gäggeler, H. W. (2007). "Gas Phase Chemistry of Superheavy Elements" (PDF). Paul Scherrer Institute. pp. 26–28.